Hurrah for Aly and Trish Morrison! They did the recent range of warhammer monsters for the Storm of Chaos supplement, but this is what they were producing 20 years ago. Originally a high elf dragon lord, I replaced the rider's head with an elf archer's bare head. The model works perfectly as a forest dragon, sinuously winding its way between the thorny branches of the forest. 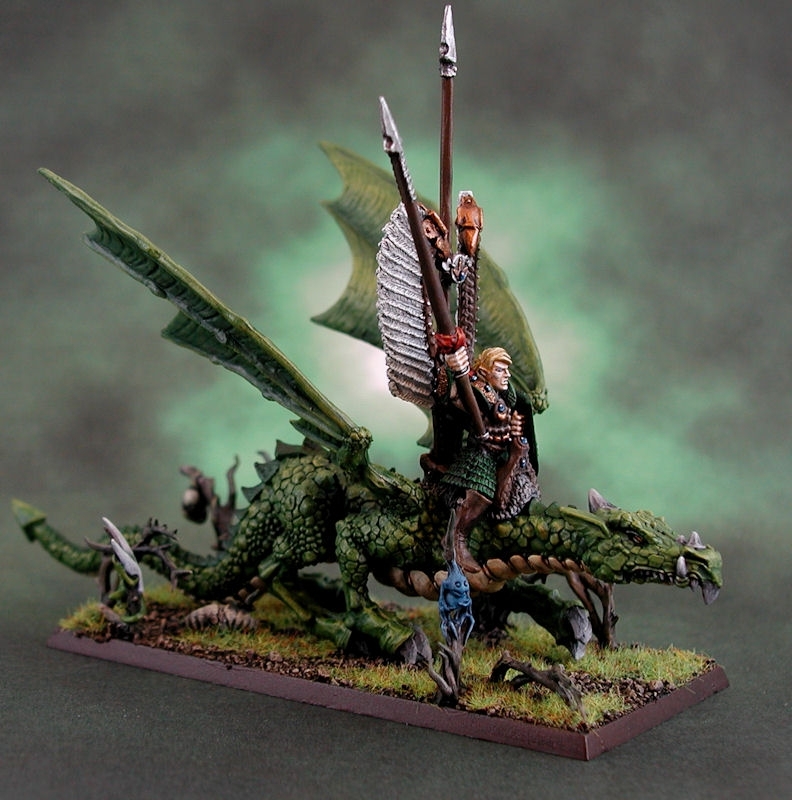 Another old model - a warhawk rider, I think, with a very old wood elf knight rider. An arm swap with a high elf knight's lance, and a thick feather on his helmet, and this wood elf noble was born. 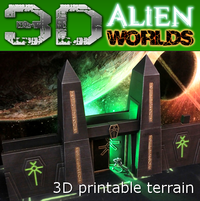 I think perhaps this was another Aly/Trish Morrison marauder miniature. 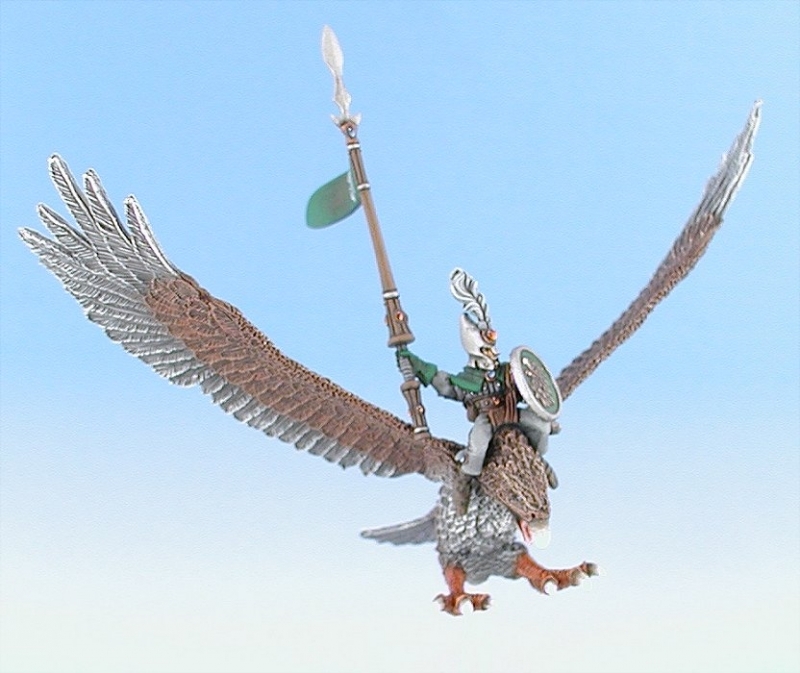 The rider originally had a winged high elf hat, which looked very odd. So I snipped off the top of her head, and added (of all things) a 40K ork's topknot and a bit of greenstuff. 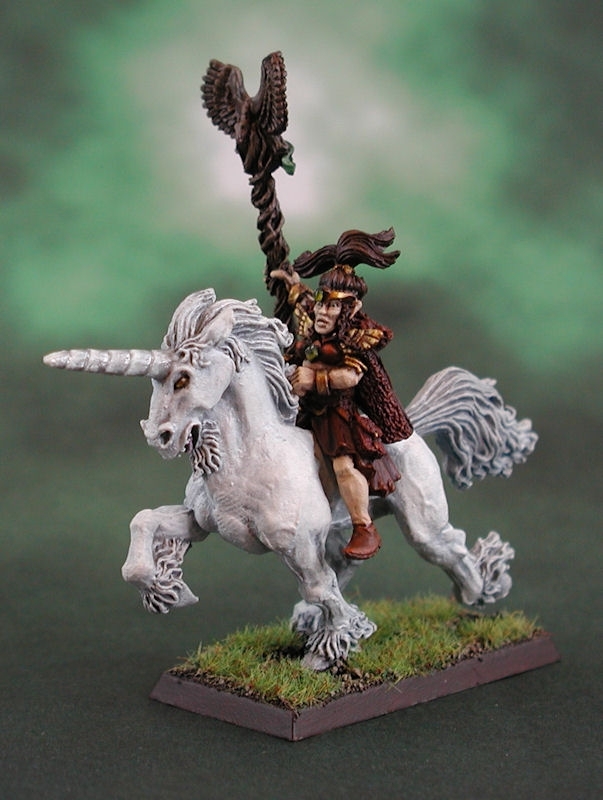 Great unicorn model too! 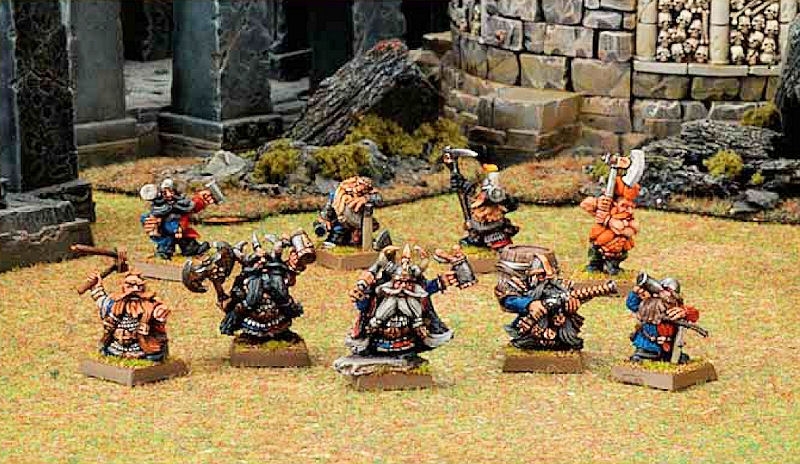 Look - really old wardancer models! 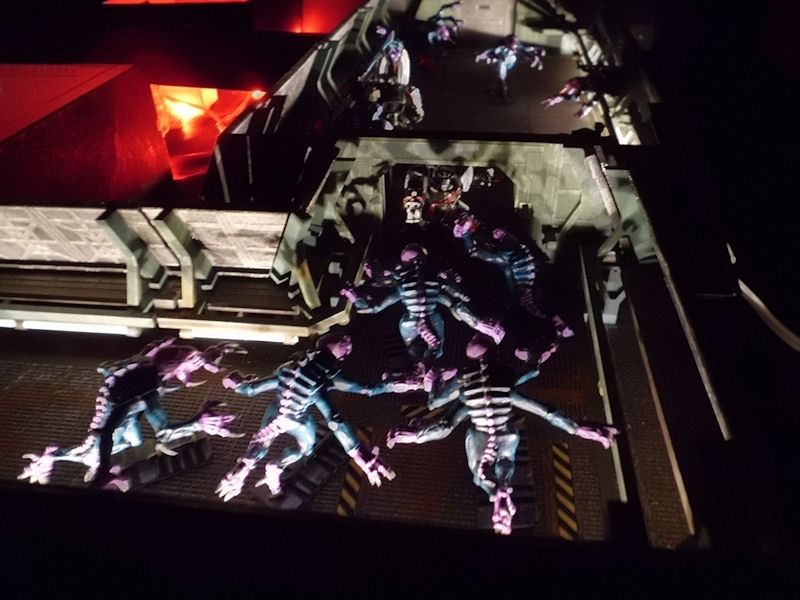 Almost all of these models have been converted with extra weapons, as the original versions didn't have two hand weapons. Didn't even have rules for them! Great poses, and a lovely variety - from Mr. Lederhosen (bottom right) to Mr, Toga (middle centre). 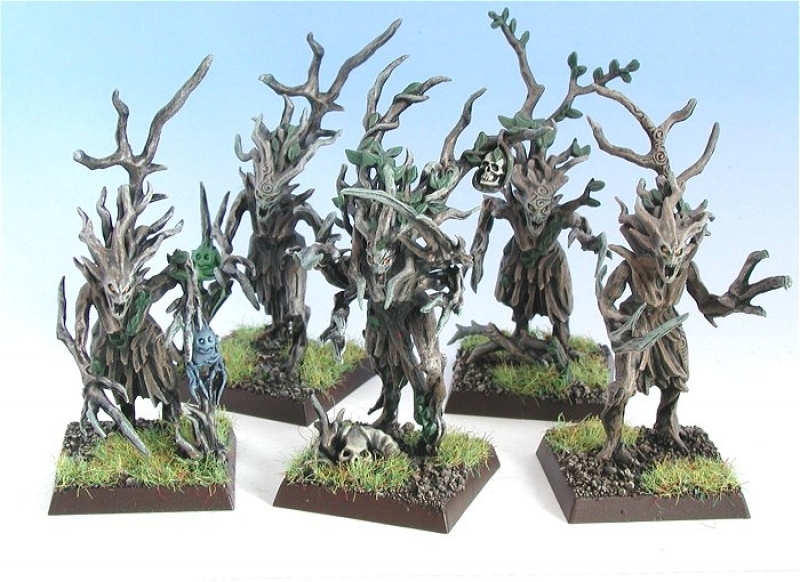 These dryads are the only unit of current GW models, and were so easy to paint! Basecoat, wash, drybrush, and they're done. I gave them the same amber gem eyes as the rest of the supernatural stuff in this army, to match the unicorns and dragons. 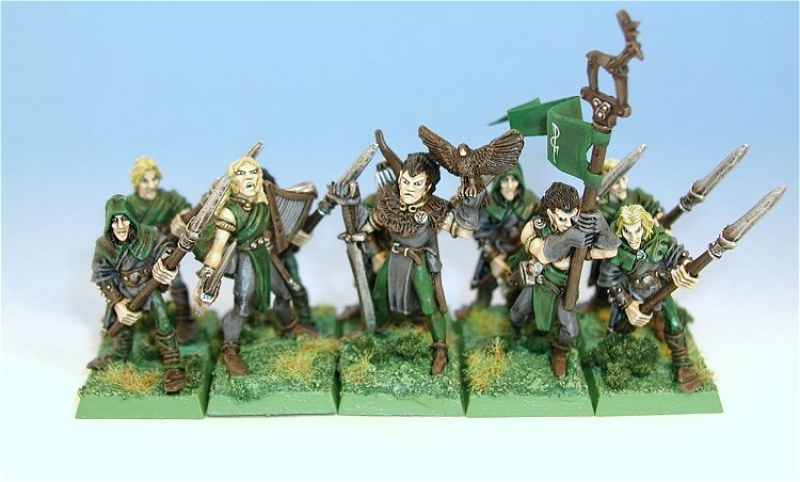 Skarloc's Wood Elf Rangers, complete with Skarloc himself. Slightly more autumnal colours for this unit - browns, greys and bronzes. Nice to update old models. More old models, but to be honest I'm not sure what to use these as? Eternal guard, maybe? 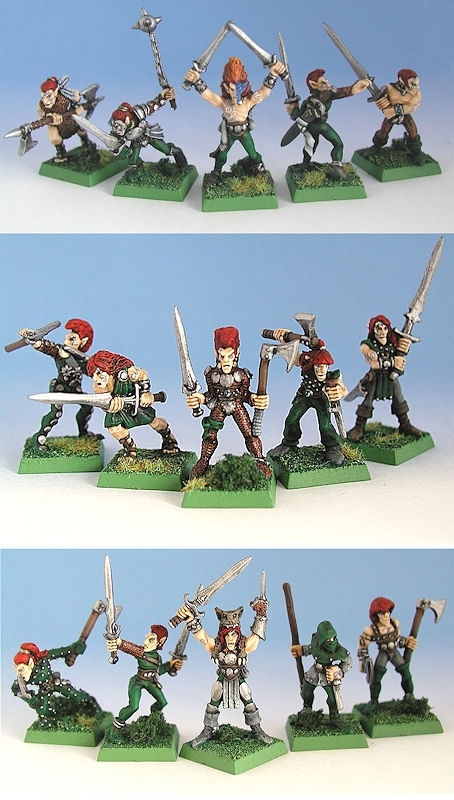 The one pose of spearman is GW, but the command group are, I think, Grenadier models. The runic banners are a tie-in between the spiky dark elf army and purist high elf army I've painted - these guys are firmly in the middle. 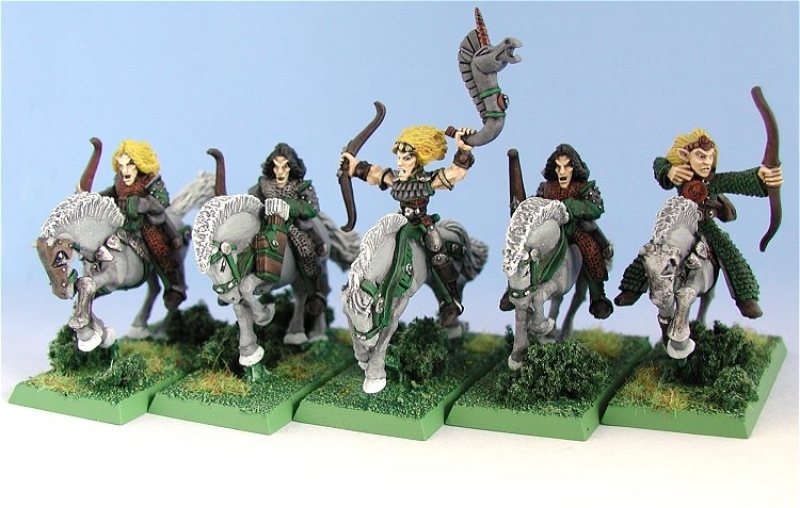 These are also very old GW wood elf models, mounted on very small horses. The new plastic glade riders have horses twice the size, but these older ones hold up quite well. The musician has a high elf trumpet replacing the original spear (?) he was holding. The model on the right is actually the hero figure who used to ride that giant eagle at the top of the page. Not a superb sculpt, maybe. And here he is ..... the warhammer world's most un-scary treeman! 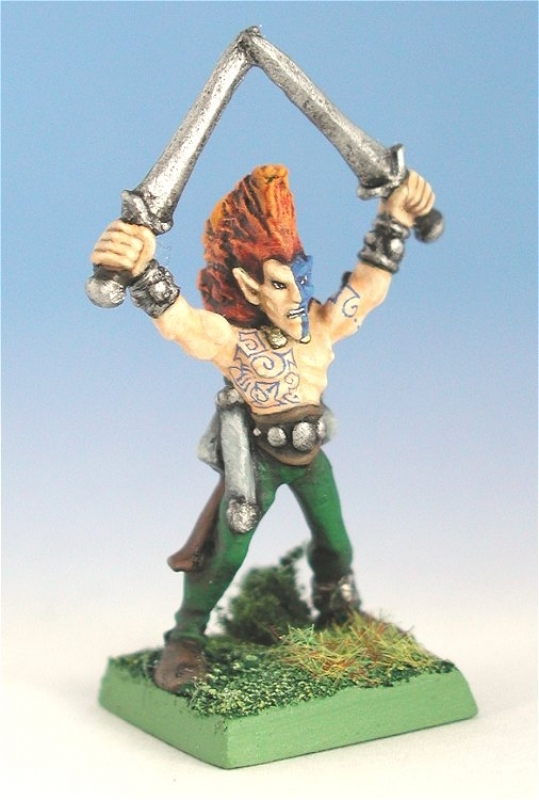 This is a really bad treeman model, smaller than current ogre models, and is posed exactly the same as it's twin model for Bloodbowl. 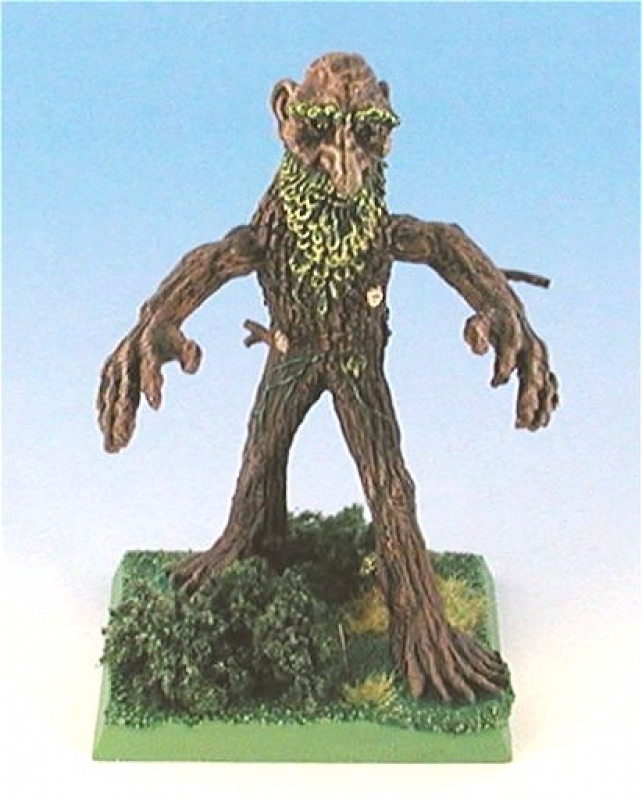 Jeez, I really want GW to come out with a really good treeman model!